in the Yucatan, Chichen Itza, Balankanche, Ek' Balam, Culuba, Uxmal, Kabah, Sayil, Labna, X' Labpak, Acanceh, Mayapan, Dzilbilchaltun, X-cambo, and more, read on . . . . . . . The art and architecture of the ancient Maya of Yucatán have fascinated visitors for more than 150 years. Incidents of Travel in Yucatán, the splendid two-volume publication written by John Lloyd Stephens and first published in New York in 1843, is still to be found on the shelves of bookstores the world over. A travel to the World of the Maya of Yucatán today is just as exciting as it was at the time of Stephens and Catherwood but can, of course, be much easier arranged and be more comfortably done. 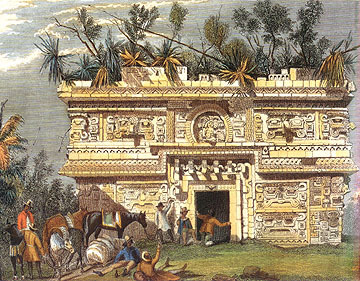 One hundred and fifty years after their report on the lost cities of Yucatan, the strikingly beautiful stone mosaic which adorns the south transverse vault of the so called "House of the Governor" at Uxmal can still be seen as it was captured by Catherwood in what is perhaps the finest drawing of Maya architecture ever done. 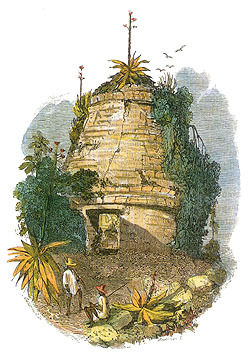 Catherwood's lithograph of the round temple at Mayapán as it still appeared in 1842 has provided Mexican archaeologists with an authentic model after which to restore the building to its present state. This unique structure may be observed in one of our excursions and it shall be our pleasure to explain to you its function and significance in the concepts of the Maya of the 13th century. Modern science has unveiled many of the mysteries, which once shrouded the civilization of the ancient Maya. Epigraphers, linguists, historians, anthropologists, and archaeologists have worked jointly in order to free the ancient Maya cities and their noble rulers from some scholarly misconceptions of the past as well as from the fancy tales that have been invented to impress ignorant visitors and which are being told and sold until today. The idea that governs our efforts is to present our guests with authentic information based on the latest results from international scientific investigations in the Maya area. We offer our guests an idea of the political and religious systems of the ancient Maya of Yucatán as well as introduce them to the most prominent protagonists who shaped history at their time and whose memory has been preserved in the hieroglyphs which adorn their temples and palaces. One such inscription can still be seen in the ancient residence of the Kokom, the "Supreme Judge" at Chichén Itzá. The hieroglyphic text is an exact description of visible and tangible reality, telling us that the palace was a low, one story building with a large number of rooms and that a slab of hard marble-stone was put in its place over the second doorway of the palace entrance in the year 870 AD. The lintel is still where the inscription says it was installed. We specialize in small groups of visitors who are more than just superficially interested in the World of the Maya of Yucatán and who want to know more about it than the regular tourist service is capable of providing. The preferred number of participants to an excursion is three to four, the maximum number is eight. We offer six different excursions. Each tour will commence in the early morning and "return to home base" during late afternoon.